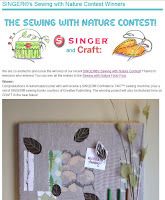 I got notice yesterday from the Singer Sewing Machine Company that my bulletin board won their "Sewing With Nature" contest. I made the bulletin board earlier this month so it was fun to have almost immediate gratification. The "Sewing With Nature" contest, run jointly by Singer and CRAFT Magazine, asked for a single submission per person through their Flickr group. The rules were easy but written loosely for individual interpretation. The project needed to include machine sewing and "integrate organic elements." I'd been wanting to make some bulletin boards for a long time. They're a great way to use beautiful little bits of fabric. 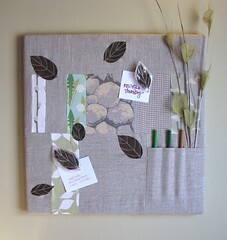 This particular bulletin board (my first), entitled "Promise of Spring," was made with a patchwork of linen and some cotton fabrics stretched over a magnetized corkboard. 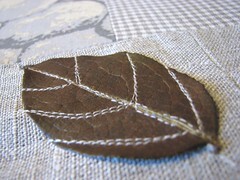 I sewed several dried salal leaves on as decoration. And then made two magnets by sewing more leaves between layers of Tyvek and then gluing to a magnet. I love the combination of fabrics. Several were from SpicedCoffee for a recent swap. They give a sense of winter with a hint of spring to come. And, of course, I'm always a fan of natural linen paired with other beautiful fabrics. What do I get for winning, you ask? A Singer Confidence 7467 sewing machine and a set of Singer sewing books. Quite fun, eh? Congratulations...I love the bulletin board! How fantastic! Enjoy your new toy.